Carrie Gooper, Sheriff of Cash Canyon has a problem. She just received a telegram from John DeRange, leader of the The Loose Change Gang. He’s challenged her to a showdown at high noon! Sheriff Gooper has to learn all about money and contend with John DeRange. First, she meets her friend Blabby Daze. Blabby has a new venture; building a water park. The only problem is he doesn’t have any money! He tells Carrie about what money is, how we use it, and that the more money you have, the more you can do with it. Carrie thanks him for his help and sets off. Next, she meets movie producer Wild Bill Hitchcock. He tells Carrie that it takes money to do all sorts of things, like for example make movies. She asks him how he can afford to make his movies. He tells her that he saves his money. He puts aside a little bit every time he gets some so he has money in the future. Carrie tells Wild Bill she has a showdown and thanks him for his time. Finally, with the help of a student volunteer, Carrie meets John DeRange. 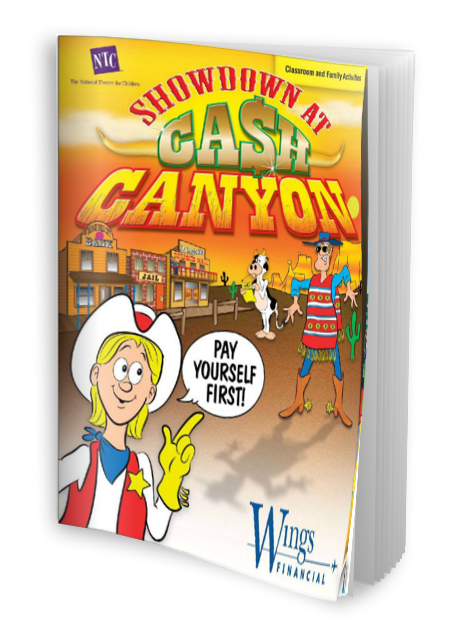 He tells her that the good people of Cash Canyon have been spending but not saving, so the money in the bank is nearly gone. It’s up to her to spread the word that it’s easy to save money. If people do that, not only will there be money in the bank, but people will be able to do many of the things they want. She agrees and thanks John for his help. 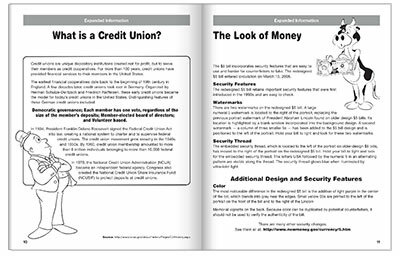 Showdown at Cash Canyon aligns with Jump$tart National Standards in K-12 Personal Finance Education & Common Core English Language Arts Standards.